You may find these example Analytica models useful to see what Analytica can do, and as inspiration or a starting point for your own models. They cover a wide variety of topics and techniques. These examples supplement the example models that are installed with Analytica into the Examples folder. You can are also invited to contribute your own models as examples. For how to do that, see Uploading Example Models. This model, along with the accompanying blog article, show how to set up a Marginal Abatement graph in Analytica. Keywords: Graph methods, carbon price, energy efficiency, climate policy, optimal allocation, budget constraint. Description: Would it be cost effective to install solar panels on the roof of my house? This model explores this question for my situation in San Jose, California. An accompanying video documents the building of this model, and is a good example of the process one goes through when building any decision model. The model explores how many panels I should install, and what the payoff is in terms of net present value, Internal rate of return and time to recoup cost. It also looks at whether I should postpone the start of the installation to take advantage of rapidly falling PV prices, or cash in on tax credits. Keywords: Renewable energy, photovoltaics, net present value, internal rate of return, tax credits, agile modeling. Description: Given a set of items, with a priority and a cost for each, the function Items_within_budget function selects out the highest priority items that fit within the fixed budget. Description: This model tests a hypothesis about the distribution of an attribute of the marginal rejectee of a grant program, given the relevance of that attribute to award of the grant. It could be used by an organization to make decisions as to whether to fiscally-sponsor another organization that will use that fiscal sponsorship to apply for grants, by looking at the effect on the pool of grant recipients overall. Evaluate a set of R&D projects, including uncertain R&D costs, and uncertain revenues if it leads to release of a commercial product. Use multiattribute analysis to compare projects, including a hard attribute -- expected net present value -- and soft attributes -- strategic fit, staff development, and public good will. 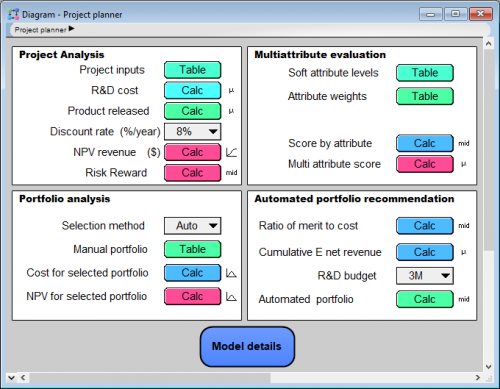 Compare cost, NPV, and multiattribute value for a selected portfolio of projects. Generate the best portfolio (ratio of NPV or multiattribute merit to cost) given a R&D budget. Description: On 2-March-2018, President Trump proposed new import tariffs on steel and aluminum. It seems as if the projected net impacts of these tariffs on the total US trade deficit and US economy depends largely on which news outlets you get your news from. We thought it would be helpful to put together a simple and easy to understand model to estimate of the net impact of these tariffs on the US trade deficit, assuming that no other factors change (e.g., no retaliatory tariffs are enacted by other countries). We wanted something that allows you to understand how its estimates are being derived, with assumptions that can be easily replaced with your own, so that the model itself would be impartial to any particular viewpoint. We want the uncertainties that are inherent in such a simple model to be explicit, so you can see the range of possibilities and not just a single guess. Finally, we wanted the model to be easy to understand fully for non-economists (a group to which we belong, too). Description: Computes amount of tax due from taxable income for a 2017 US Federal tax return. To match the IRS's numbers exactly, it is necessary to process tax brackets correctly as well as implementation a complex mix of rounding rules that reproduce the 12 pages of table lookups from the Form 1040 instructions. 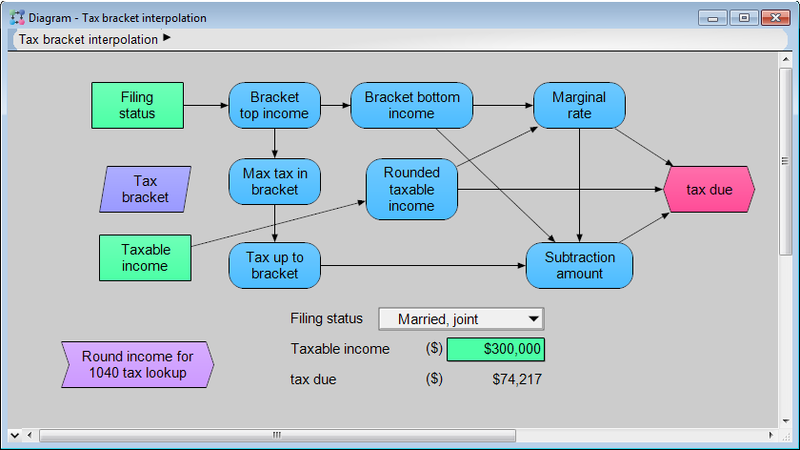 This model is showcased in a blog article, How to simplify the IRS Tax Tables. Description: You have a bunch of chance variables, each with a probability distribution. Their joint sample, however, contains some combinations of points that are (for one reason or another) physically impossible. We'll call those infeasible points. You'd like to eliminate those points from the sample and keep only the feasible points. This module implements a button that will sample a collection of chance variables, then reset the sample size and keep only those sample points that are "feasible". Obviously, this approach will work best when most of your samples are feasible. If you can handle the "infeasible" points in your model directly, by conditioning certain chance variables on others, that is far preferable. But there are some cases where this solution (although a bit of a kludge) is more convenient. The instructions for how to use this are in the module description field. Description: When fitting a function to data, if you have too many free parameters relative to the number of points in your data set, you may "overfit" the data. When this happens, the fit to your training data may be very good, but the fit to new data points (beyond those used for training) may be very poor. Cross-validation is a common technique to deal with this problem: We set aside a fraction of the available data as a cross-validation set. Then we begin by fitting very simple functions to the data (with few free parameters), successively increasing the number of free parameters, and seeing how the predictive performance changes on the cross-validation set. It is typical to see improvement on the cross-validation set for a while, followed by a deterioration of predictive performance on the cross-validation set once overfitting starts occurring. This example model successively fits a non-linear kernel function to the residual error, and uses cross-validation to determine how many kernel functions should be used. Requires Analytica Optimizer: The kernel fitting function (Kern_Fit) uses NlpDefine. Description: Bootstrapping is a technique from statistics for estimating the sampling error present in a statistical estimator. The simplest version estimates sampling error by resampling the original data. This model demonstrates how to do this in Analytica. 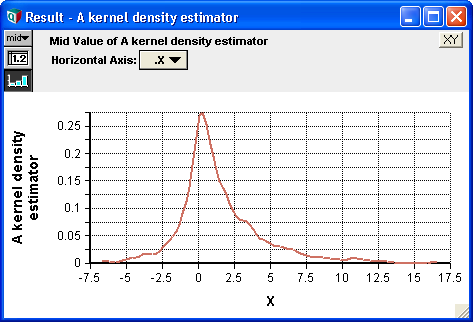 Description: This example demonstrates a very simple fixed-width kernel density estimator to estimate a "smooth" probability density. 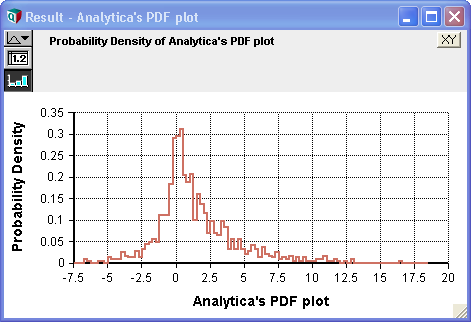 The built-in PDF function in Analytica often has a choppy appearance due to the nature of histogramming -- it sets up a set of bins and counts how many points land in each bin. A kernel density estimator smooths this out, producing a less choppy PDF plot. This smoothing is built into Analytica 4.4. You can select smoothing from the Uncertainty Setup dialog. 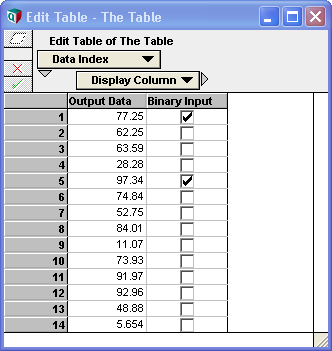 Description: Presents an input table to a user, where one column is populated with computed output data, the other column with checkboxes for the user to select. Although the Output Data column isn't read only, as would be desired, a Check Attribute has been configured to complain if he does try to change values in that column. The model that uses these inputs would ignore any changes he makes to data in the Output Data column. Populating the Output Data column requires the user to press a button, which runs a button script to populate that column. This button is presented on the top-level panel. If you change the input value, the output data will change, and then the button needs to be pressed to refresh the output data column. Description: Too many environmental issues cause bitter public controversy. 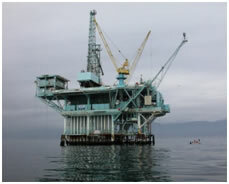 The question of how to decommission California's 27 offshore oil platforms started out as a typical example. But remarkably, after careful analysis a single option, "rigs to reefs", obtained the support of almost all stakeholders, including oil companies and environmentalists. A law to enable this option was passed by the California State house almost unanimously, and signed by Governor Arnold Schwarzenegger. Description: Will you end up with a bigger nest egg at retirement with a 401(k), traditional IRA, Roth IRA or a normal non-tax-advantaged brokerage account? For example, comparing a Roth IRA to a normal brokerage, intermediate capital gains compound in the Roth, but eventually you pay taxes on those gains at your income tax rate at retirement, whereas in the brokerage you pay capital gains taxes on the gains, which is likely a lower tax rate. So does the compounding outweigh the tax rate difference? What effect do the higher account maintenance fees in a 401(k) account have? How sensitive are these conclusions to the various input estimates? The answers to all these questions depend on your own situation, and may different for someone else. Explore these questions with this model. Keywords: 401(k), IRA, retirement account, decision analysis, uncertainty, sensitivity analysis, MultiTables. Download: Comparing retirement account types.ana. 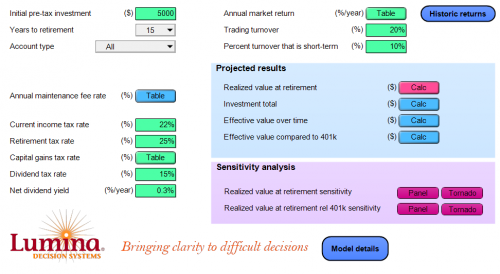 For a version without the sensitivity analysis part, which has fewer than 100 objects and can thus be modified using Analytica Free 101, you can use this one: Comparing retirement account types without sensitivity.ana. Description: A simple model to assess what time I should leave my home to catch a plane, with uncertain driving time, walking from parking to gate (including security), and how long I need to be at the gate ahead of scheduled departure time. It uses a loss model based on minutes, assuming I value each extra minute snoozing in bed and set the loss if I miss the plane to 400 of those minutes. It illustrates the EVIU (expected value of including uncertainty) i.e. the difference in expected value if I make a decision to minimize expected loss instead of decision to minimize time ignoring uncertainty (assuming each distribution is fixed at its mid value). For more details see "The Value of Knowing How Little You Know", Max Henrion, PhD Dissertation, Carnegie Mellon University, 1982. Keywords: Decision theory, decision analysis, uncertainty, Monte Carlo simulation, value of information, EVPI, EVIU. Description: Acid rain in eastern US and Canada caused by sulfur dioxide is emitted primarily by coal-burning electric-generating plants in the Midwestern U.S. This model demonstrates a marginal analysis a.k.a. benefit/cost analysis to determine the policy alternative that leads us to the most economically efficient level of cleanup. Description: This model implements a continuous-time Markov chain in Analytica's discrete-time dynamic simulation environment. It supports immigration to, and emigration from, every node. It can be used by an arts organization to probabilistically forecast future audience evolution, in both the short and the long (steady state) term. It also allows for uncertainty in the input parameters. A model of how photosynthesis is regulated inside a cyanobacteria. As light exposure varies over time (and you can experiment with various light intensity waveforms), it simulates the concentration levels of key transport molecules along the chain, through the PSII complex, plasto-quinone pool, PSI complex, down to metabolic oxidation. The dynamic response to light levels, or changes in light levels, over time becomes evident, and the impact of changes to metabolic demand can also be observed. 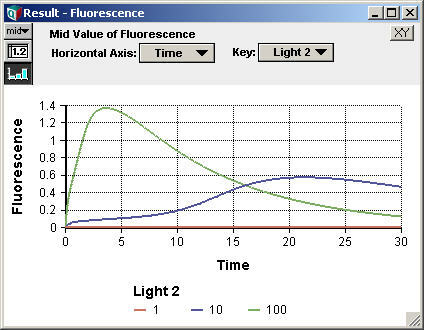 In the graph of fluorescence above, we can see an indicator of how much energy is being absorbed, in three different cases (different light intensities). In the two higher intensity cases, photoinhibition is observed -- a protective mechanism of the cell that engages when more energy is coming in than can be utilized by the cell. Excess incoming energy, in the absence of photoinhibition, causes damage, particularly to the PSII complex. 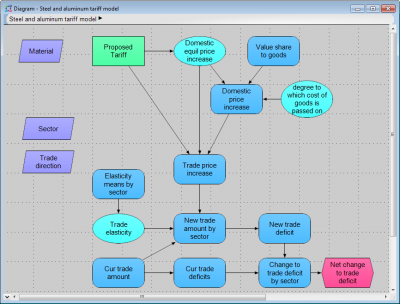 This model uses node shapes for a different purpose than is normally seen in decision analysis models. In this model, ovals, instead of depicting chance variables, depict chemical reactions, where the value depicts the reaction rate, and rounded rectangles depict chemical concentrations. Two models are attached. The first is a bit cleaner, and focused on the core transport chain, as described above. The second is less developed, but is focused more on genetic regulation processes. Photosystem.ana - rough sketch of genetic regulation. Description: This model contains some examples of time-series re-indexing. It is intended to demonstrate some of these basic techniques. In this example, actual measurements were collected at non-uniform time increments. Before analyzing these, we map these to a uniformly spaced time index (Week), occurring on Monday of each week. The mapping is done using an interpolation. The evenly-spaced data is then used to forecast future behavior. We first forecast over an index containing only future time points (Future_weeks), using a log-normal process model based on the historical weekly change. We then combine the historical data with the forecast on a common index (Week). A prob-bands graph of the weekly_data result shows the range of uncertainty projected by the process model (you'll notice the uncertainty exists only for future forecasted values, not historical ones). Description: Here is a calculator for computing the maximum load that can be handled by a Douglas Fir - Larch post of a given size, grade, and composition in a construction setting. Description: Computes the load that a Douglas-Fir Larch post can support in compression. Works for different timber types and grades and post sizes. 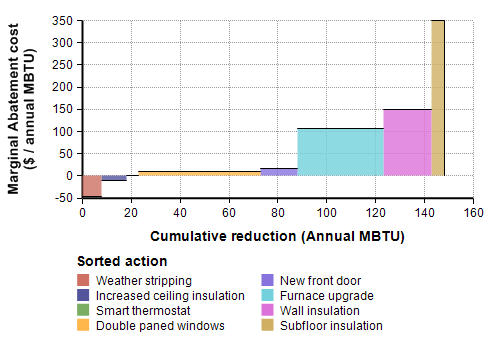 Description: A demonstration showing how to analyze lifecycle costs and savings from daylighting options in building design. 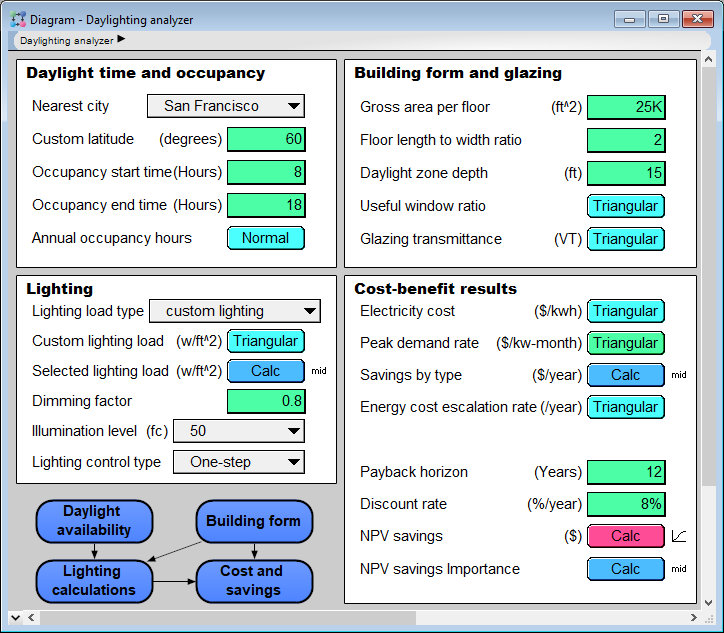 Analysis based on Nomograph Cost/Benefit Tool for Daylighting. adapted from S.E. Selkowitz and M. Gabel. 1984. "LBL Daylighting Nomographs," LBL-13534, Lawrence Berkeley Laboratory, Berkeley CA, 94704. (510) 486-6845. 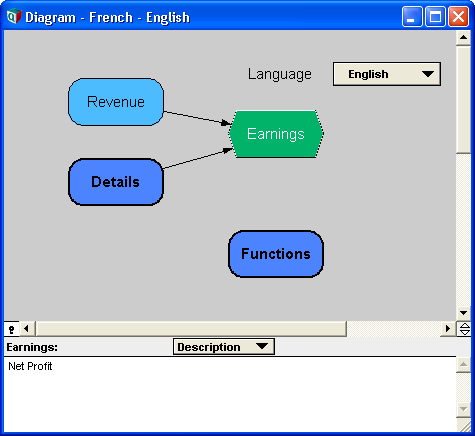 Description: An example showing how to use Choice menus and Checkbox inside an Edit table. It also shows how to use the Cell default attribute to specify default values (including Choice menu and Checkbox with default selections) specified in "Default Plant Data" to be used when user creates a new row in the Edit table. This model shows how to demonstrates the use of choice pulldowns in edit tables. The model is created during a mini-tutorial on Inserting Choice Controls in Edit Table Cells elsewhere on this Wiki. Keywords: Edit table, Choice menu, pulldown menu, checkbox, Power plants. Description: This model of an electrical network minimizes total cost of generation and transmission. Each node in the network has power generators and consumers (demand). Nodes are connected by transmission links. Each link has a maximum capacity in Watts and an admittance (the real part of impedance is assumed to be zero). Each generator has a min and max power and a marginal cost in $/KWh. The model uses a linear program to determine how much power each generator should produce so as to minimize total cost of generation and transmission, while satisfying demand and remaining within link constraints. Description: A model which highlights Cell Formatting and Computed Cell Formats. Model result is a 'color map' wherein the cell fill color is computed based on three input variables (R, G, and B), the computed color is displayed in hexadecimal, and the font color of the hexadecimal color is determined by the cell fill color. Description: On July 15, 2018, France beat Croatia 4-2 in the final game of the World Cup to become world champions. But how much of that is can be attributed to France being the better team versus to the random chance? This model accompanies my blog article, World Cup Soccer. How much does randomness determine the winner?, where I explore this question and use the example to demonstrate the Poisson distribution. Description: Show it an image, and it tries to recognize what it is an image of, classifying it among 1000 possible categories. It uses an 18-layer residual network. This model is described and demonstrated in a video in the blog article An Analytica model that recognizes images. Description: The model shows how to transform an array from a finer-grain index (e.g., Month) onto a coarser index (e.g., Quarter). We generally refer to this as aggregation. The model illustrates the direct use of Aggregate, as well as a method to do this used before Aggregate was added to Analytica in release 4.2. Keywords: Aggregation, level of detail, days, weeks, months, quarters, years. Description: Convolution is used mostly for signal and systems analysis. It is a way to combine two time series. This model contains function Convolve(Y, Z, T, I), that computes the convolution of two time series. The model contains several examples of convolved functions. A time series is a set of points, (Y, T), where T is the ascending X-axis, and the set of points is indexed by I. The values of T do not have to be equally spaced. The function treats Y and Z as being equal to 0 outside the range of T. The two time series here are the set of points (Y, T) and the set of points (Z, T), where both sets of points are indexed by I. 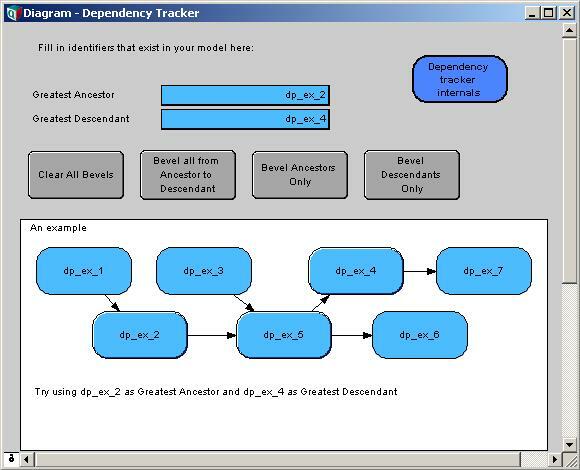 Description: This module tracks dependencies through your model, updating the visual appearance of nodes so that you can quickly visualize the paths by which one variable influences another. You can also use it to provide a visual indication of which nodes are downstream (or upstream) from an indicated variable. The module contains button scripts that change the bevel appearance of nodes in your model. To see how Variable X influences Variable Y, the script will bevel the nodes for all variables that are influenced by X and influence Y. Alternatively, you can bevel all nodes that are influenced by X, or you can bevel all nodes that influence Y. Description: Maintains a single influence diagram with Title and Description attributes in both English and French. With the change of a pull-down, the influence diagram and all object descriptions are instantly reflected in the language of choice. If you change a title or description while viewing English, and then change to French, the change you made will become the English-language version of the description. Similarly if you make a change while viewing French. Description: Suppose you receive data in an XML format that you want to read into your model. This example demonstrates two methods for extracting data: Using a full XML DOM parser, or using regular expressions. The first method fully parses the XML structure, the second simply finds the data of interest by matching patterns, which can be easier for very simple data structures (as is often the case). Functions for finding distance between two latitude-longitude points along the great circle. where «N_t» is the population size (number of individuals) at time t, «N_t+1» is the population size at time t + 1, «Lambda» is the intrinsic rate of increase and the «loss rate» is the percentage of fish or animals killed but not retrieved relative to the «landed catch», or catch secured. The question here is to determine how many fish or animals can be caught (landed) annually so that the probability of the population declining X% in Y years (decline threshold) is less than Z% (risk tolerance). Two models are available for download. One uses the Optimizer (NlpDefine) to find the maximum landed catch at the risk tolerance level for the given decline threshold. The other (for those using a version of Analytica without Optimizer) uses StepInterp in an iterative way to get that maximum landed catch. 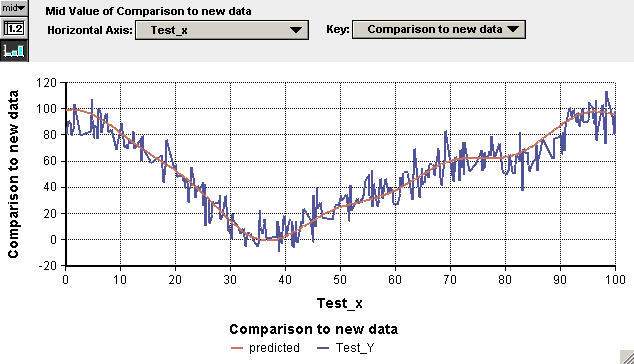 Description: A feed-forward neural network can be trained (fit to training data) using the Analytica Optimizer. This is essentially an example of non-linear regression. This model contains four sample data sets, and is set up to train a 2-layer feedforward sigmoid network to "learn" the concept represented by the data set(s), and then test how well it does across examples not appearing in the training set. 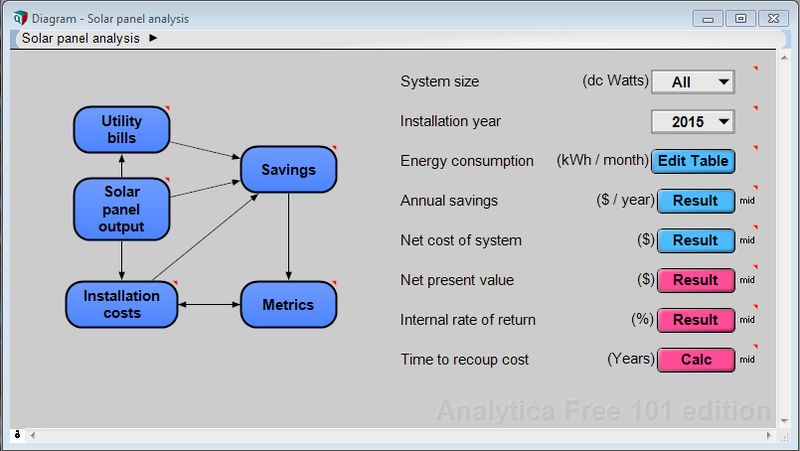 Developed during the Analytica User Group Webinar of 21-Apr-2011 -- see the webinar recording. Description: An example of risk analysis with time-dependence and costs shifted over time. What is the probability of more than one quake in a specific 10 year period. What is the probability that in my time window my costs exceed $X? Earthquakes are Poisson events with mean rate of once every 10 years. Damage caused by such quake is lognormally distributed, with mean $10M adn stddev of $6M. Cost of damage gets incurred over the period of a year from the date of the quake as equipment is replaced and buildings are repaired over time: 20% in 1st quarter after quake, 50% in 2nd quarter, 20% in 3rd quarter, 10% in 4th quarter. Description: A lender has a large pool of money to loan, but needs to decide what credit rating threshold to require and what interest rate (above prime) to charge. The optimal value is determined by market forces (competing lenders) and by the probability that the borrower defaults on the loan, which is a function of the economy and borrower's credit rating. The model can be used without the Analytica optimizer, in which case you can explore the decision space manually or use a parametric analysis to find the near optimal solution. Those with Analytica Optimizer can find the optimal solution (more quickly) using an NLP search. 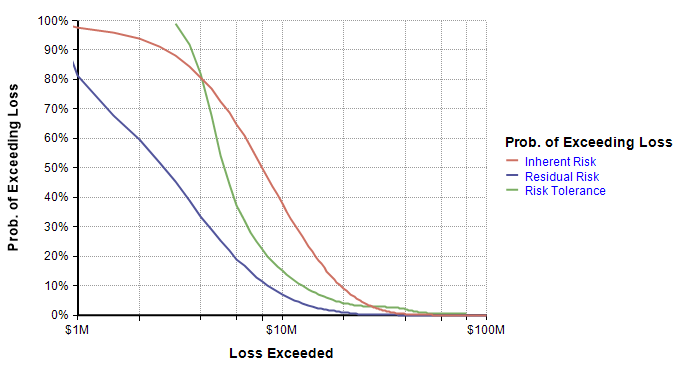 Description: The model simulates loss exceedance curves for a set of cybersecurity events, the likelihood and probabilistic monetary impact of which have been characterized by system experts. The goal of the model is assess the impact of mitigation measures, by comparing the residual risk curve to the inherent risk curve (defined as risk without any mitigation measures) and to the risk tolerance curve. This is a translation of a model built by Douglas Hubbard and Richard Seiersen which they describe in their book How to Measure Anything in Cybersecurity Risk, and which they make available here. 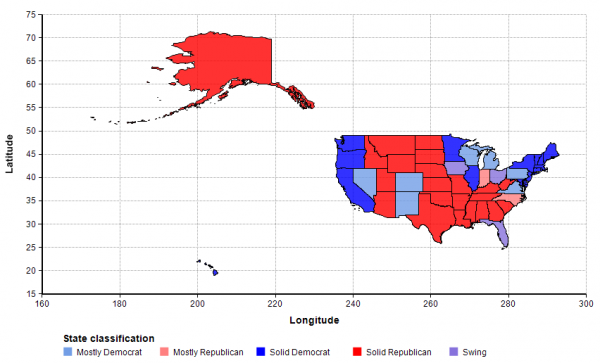 Description: This example contains the shape outlines for each of the 50 US states, along with a graph that uses color to depict something that varies by state (historical political party leaning). You may find the shape data useful for your own plots. In addition, it demonstrates the polygon fill feature that is new in Analytica 5.2.